Install with 3-point seat belt, or optional ZERO ISOFIX Platform in the car. ZERO is the infant car seat that combines an extremely light-weight shell with maximum safety. Made using breathable materials, ZERO is very comfortable for the baby and easy to handle for parents. ZERO is ideal for travelling but also for going out walking, as it is fitted with the “Pro-Fix” system, meaning that with just one movement, it can be fitted onto your pram chassis to make a travel system. Like the rest of the Jané range, the BeCool ZERO infant car seat is fitted with the Pro-Fix system (patented). This means it can be connected quickly and safely with just one movement onto the ISOFIX base in the car or onto the pushchair chassis. With Jané everything is integrated into the system, so with the simple press of a button your travel system can be transformed. 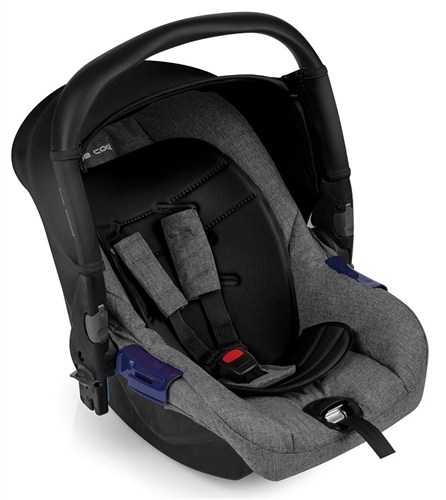 Car seat with dual installation: Seat Belt or optional Isofix Base. built-in seat belt lock, for greater stability. Locks and unlocks the car seat with just one movement - no more awkward fitting kits.. Zero and Koos infant car seat installation video with seat belt or Isofix base in the car. Our car seats meets and exceeds the ECE R44.04 Safety Standard or the iSize R129 standard.